Having a shop that stands out from the rest can be difficult however, you can make the layout of your shop as buyer friendly as possible which should help with sales. The last thing you want to do is to put buyers off as soon as they walk into the shop. Most people have walked into a shop and walked straight back out again purely because they don’t like the look of it. There are many ways to lay out your shop which help make favourable decisions for shoppers. We covered our top 4 London Shops and Department stores and these will all have a large amount of thought put into their layout and it most probably contributes to how successful they have become. Other than the psychology behind shopping there are some secrets to the layout of your shop which will help with boosting sales! Your shop window and entrance is the first thing seen by customers so it must be eye catching. The best idea is to showcase some of your best products but still make it look slick and professional while showing off the theme of your shop. Make sure your entrance is friendly and helps customers acclimatise to the shop. Buyers don’t want to be overwhelmed by products so give them time to look at a few products first before bombarding them with shelves full of items. The Invariable right is very important when choosing the layout of your shop. Paco Underhill carried out studies and found that consumers give most of their attention to the right hand side of the shop so ensure the right side of the shop is neat, and eye catching. Depending on the size of your shop you should have signs to help customers find exactly what they are looking for as quickly as possible. These kind of signs should not be product promotion signs but instead use navigation signage which you will see hanging from the roof. Make the signs as clear and concise as possible. When placing items together you must think about how a customer buys them rather than organising them in categories. Make the shopping experience as easy as possible for the customer so that it is easy to find the products. Also don’t crowd products, especially if they are popular, because they tend to blend in. Make the rail/shelf as eye catching as possible. If products are difficult to find the customer may end up frustrated, forcing them to leave. Place your top selling products or products that you want to sell at eye level because buyers are very lazy and firstly look between waist and eye level. However, don’t forget that you should make the area spacious so you don’t confuse the buyer or make it too crammed. Make sure all products have a neat and eye catching layout and do not over clutter and don’t under stock. It must be just right. Your shop should be tidy at all times with your staff constantly walking round checking that everything is still in place. Boring products will distract and even frustrate customers which may put them off buying. 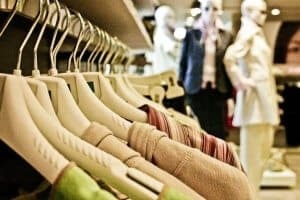 Overall, the layout of a shop is very important and if it is not done properly it could lose you a large amount of sales. Take time to plan the layout of your shop in detail and do research on what works best for your industry. Looking for a Shop Insurance quote? Let QuoteSearcher find the best Shop Insurance policy for your retail business - to ensure you, your trade and your stock are properly covered.